The Nikon D300 is a DX format DSLR (1.5x crop factor) has a 12 megapixel CMOS sensor, ISO range of up to 6400, 51 point AF sensor, 14-bit A/D conversion, six frames per second shooting speed (upgradable with the addition of a battery grip), self-cleaning sensor and a 3.0 inch LCD (922,000 pixels) with Live View. Digital Camera Resource Page reviews the Nikon D300 and writes: ‘When Nikon announced the D300, the digital photography world stood up and took notice. When people call the D300 a "baby D3", they’re not kidding. The D300 has nearly the exact same feature set, but with an APS-C / DX-format sensor instead of a full-frame one. That means you get the super-fast performance of the EXPEED image processor, live view on a brilliant 3-inch LCD display, a 51-point autofocus system, dust reduction, full manual controls, and the expandability that you’d expect on a Nikon SLR. You also get excellent image quality, especially if you tweak a few basic settings. It’s not often that I review a camera actually lives up to the manufacturer’s hype — and the D300 does exactly that." Camera Labs test the Nikon D300 and concludes ‘There’s no denying the Nikon D300 is a highly capable DSLR which will delight enthusiasts and satisfy the demands of pros looking for a backup or ‘budget’ body. Certainly no-one does ergonomics like Nikon and despite a handful of annoyances, it’s also the most feature-packed DSLR of its class. But there’s also no denying it’s also comfortably more expensive than many rivals while not delivering significantly better image quality. Indeed in the case of the Sony A700, the image quality is essentially the same. If you’re after a big step-up in image quality from the Nikon system, you’ll need to look at the D3. But ultimately the D300 remains a superb DSLR and one of the best we’ve tested at Camera Labs – it’s certainly a model we can Highly Recommend." Nikon (www.nikonusa.com) today introduced its most advanced DX-format digital SLR camera, the D300. Engineered with pro-level features and performance, the 12.3 effective megapixel D300 combines brand new technologies with advanced features inherited from Nikon’s newly announced D3 professional digital SLR camera to offer serious photographers remarkable performance, combined with agility. Similar to the D3, the D300 features Nikon’s exclusive EXPEED Image Processing System that is central to driving the speed and processing power needed for many of the camera’s new features. 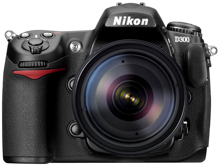 The D300 features a new 51-point auto focus system with Nikon’s 3D Focus Tracking feature and two new LiveView shooting modes that allow users to frame a photograph using the camera’s high-resolution LCD monitor. The D300 shares a similar Scene Recognition System as found in the D3 that promises to greatly enhance the accuracy of auto focus, auto exposure and auto white balance by recognizing the subject or scene being photographed and applying this information to the calculations for the three functions. This entry was posted in Digital Cameras, Nikon and tagged Nikon, Nikon DSLR on March 3, 2008 by jonathanb.